As you may or may not know (likely not), every October I take it upon myself to select and watch at least 1 horror flick per day. This makes October a lot like most months, but now I have a reason to justify my viewing preferences. I began doing this a few years ago, and it’s pretty fun when you’re not trying to shoehorn in a movie at 2am so you don’t “break the streak”. I wrote about it this year (and last year) at length over at Micro Shock (www.dorkswithoutfaces.com) and will likely port over this years rundown and try to juggle two blogs at once. Crazy ? Perhaps. Necessary ? Not really ? On to the movie ? Sure ! Now, let me start off by saying that “Popcorn” should henceforth be referred to by its alternate/French title of “Possessor”. 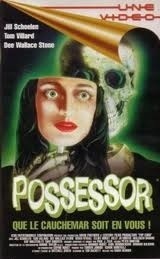 For one thing the movie is more or less about a short film called (take a guess) “Possessor”, plus it just SOUNDS cooler. 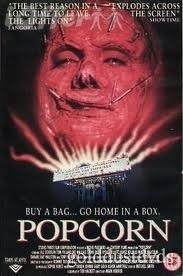 I mean, yeah, they eat popcorn in the movie at one point, but when you hear that title it reminds me of that weird instrumental song called that (http://youtu.be/iDHrXeEItu4), or maybe a lesser known Disney film. Anyway, the basic premise of “Possessor” (that’s right) is that a film class plans a fundraiser at an old theater. They play 3 William Castle-esque gimmick movies and, in the process of cleaning up, find an obscure short film by Manson-esque cult leader Lanyard Gates (wicked name) called, wait for it, “Possessor”. They watch the film (obviously) and Lanyard resembles a figure that the lead character has been dreaming / writing a screenplay about. As the marathon begins, the bodies start piling up ! Is it Lanyard Gates, back for revenge 20 years after murdering his family onstage at the theater and attempting to burn it down ? We’ll find out !! 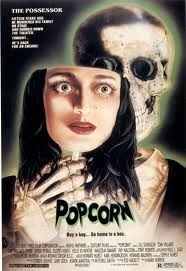 I actually watched this last year for my 2011 Horrorthon and I remembered enjoying it enough to give it another shot. For a 1991 film it certainly has its share of 80s music. And reggae music (/band that bum rushes the stage and performs between the second and third movie. Weird). Turns out it was filmed entirely in Jamaica, so I guess that part makes sense. While I really enjoyed the premise, I can’t say that it’s a great film. It sort of rides the line between cheesy comedy and genuinely unsettling moments (few, but they’re there). The short film “Possessor” is pretty creepy in a “video from The Ring” sort of way, and there are some pretty cool deaths (including more than 1 person being impaled by an enormous mechanical mosquito. Yeah). Ironically I might prefer to see the 3 fabricated movies within the movie – Mosquito, The Stench and The Electrofied Man. Watching this really made me think of our own local cult theater The Mayfair (www.mayfairtheatre.ca) and how sweet it would be to have a gimmicky screening like this one. Albeit with less murders. I also have to give props to the movies’ best scene, in which the (badly burned) killer effortlessly switches from (face)mask to mask, replicating each victims’ voice. Very creepy and reminiscent of that scene in “Fallen” where the devil character transfers from person to person (by touch) and menaces Denzel Washington in a seamless soliloquy. Good stuff. In the end “Possessor” has enough heart, solid kills and ingenuity to reccomend, but I wouldn’t say it’s amazing or worth buying. Although Lanyard Gates is a pretty great name, I think we can all agree on that one. This entry was posted in Reviews and tagged Animal Crackers, Bench, DVD, Fright, Horror, Lanyard, Movie, October, Popcorn, Possessor, Scary by lazron. Bookmark the permalink.